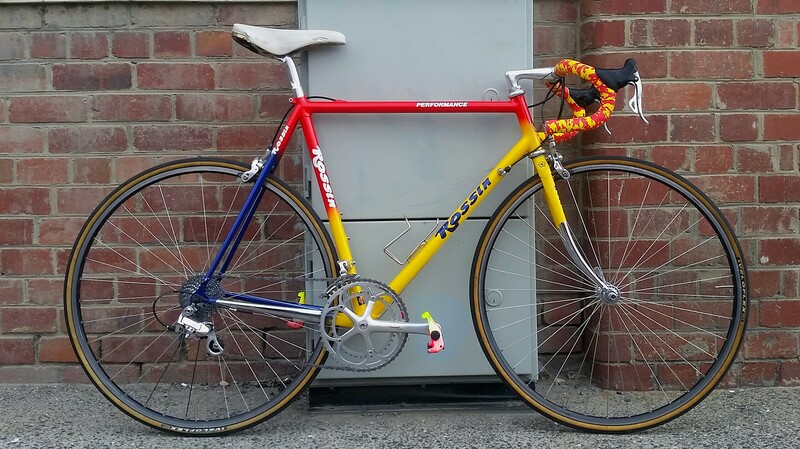 Broke my Colnago, bought this frameset NOS to swap all the parts onto. Think it’s Columbus Genius, brazed front end, lugged rear, mix of Mirage/Record parts. The paint suggests it dates to about 1993, although there’s nothing else to date it by. I like how it rides, rear is very short, front is quite slack, it’s very stiff sprinting too. Wouldn’t mind trying a carbon fork with a little less rake. I’m starting a change.org petition against putting a carbon fork on it. Suitable splash tape is suitable, balleur.